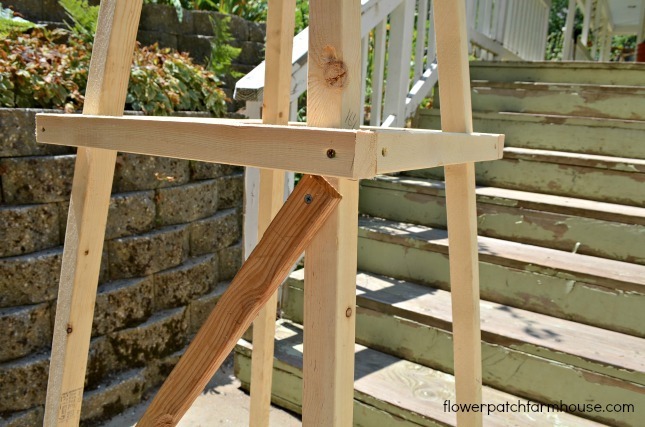 Easy Garden Obelisk you can build on a budget. This is the second DIY obelisk design we have built and shared. These are great for roses, tomatoes, sunflowers and even squash. This garden element supports plants that need it with great style. Obelisks are great for adding height and structure to any garden but they are particularly useful in smaller garden spaces. You can make them tall or short, fat or skinny and it doesn’t take much skill or money to make this one. You could build this beauty for around $25 in materials. Mine has been in the garden for 3 years now and it is still going strong. In fact, my Tess D’Ubervilles David Austin rose absolutely loves it and is nearly covering it completely with fabulously red blooms. This is a variation on my original Easy Garden Obelisk. And we also made an Arbor for the entrance to my Secret Garden with 2 of these and a DIY ladder across the top. I have white roses planted at the base and I hope soon it will be festooned with delicate white blooms. I want to add a fragrant clematis or other vine as well but not sure what yet. Since the basics are the same as our original obelisk (link to simple drawing plant below) I am not going to bore you with all the details but I will show you some photos of how he did the X pieces. and the other goes on the inside. And that is it….for a rough sketch of the original obelisk with measurements go here. Put it in your garden and add a beautiful climbing rose and before you know it you will have this. Just note that you can build these any size you like, I have a few lined up to build for tomato supports, they look so much more attractive in the garden than the wire ones I have been using. If you build any please send me a note or find me on Facebook and share photos. Just beautiful – love that green – what a great color for a garden – definitely pinning this ! I am still loving the green. I find I prefer this X design over the ladder design of the first one we built and the green to the purple. I have a climbing rose I think I will use it for. Those obelisk frames are wonderful, wonderful. You give me things that I can actually build with my skills and I saved the tool box design for this summer. Your site is very helpful in so many ways. I love the apple green color and if not white, I would want green, I think. This obelisk is perfect for my tiny garden attached to this commercial building. Since I have no horizontal room this is the perfect answer for me. I Pinned this, too. It is so good. Thank you! I am so glad this works for you. This is one of those projects of our that I am more in love with the result than when we first completed them. 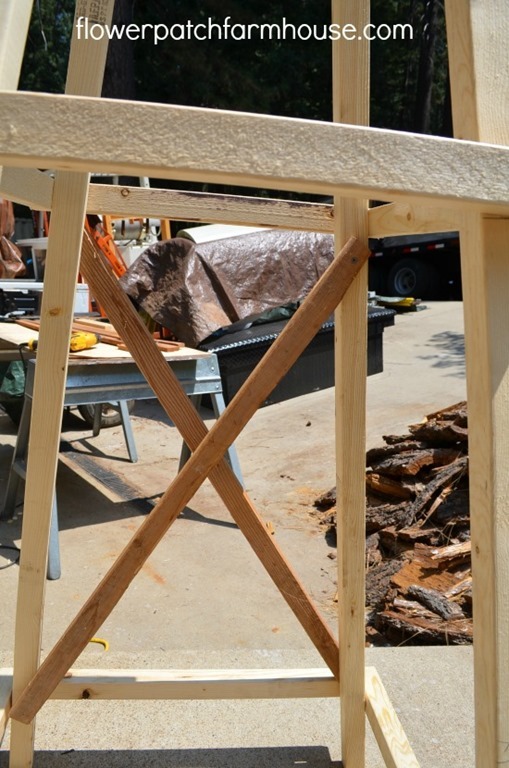 And they are scalable, you want it smaller just use smaller pieces of wood. I have been toying with finding a way to make them from rebar for the fun of it. I love this idea! And I’m liking the purple. If your vine is green or green and white, the pops of color that would show through would be lovely. You know that the primary color you’d see would be green not the purple. Anyone with a shady garden (and thus notable to have much in the way of flowers) could use this idea to add color to their green garden. So true, perfect for the shade garden, maybe a lighter lavender to show up even better peeking thru the green vines. I have an arbor now to paint and am debating on what to paint it. You have some really good ideas – thank you for sharing. 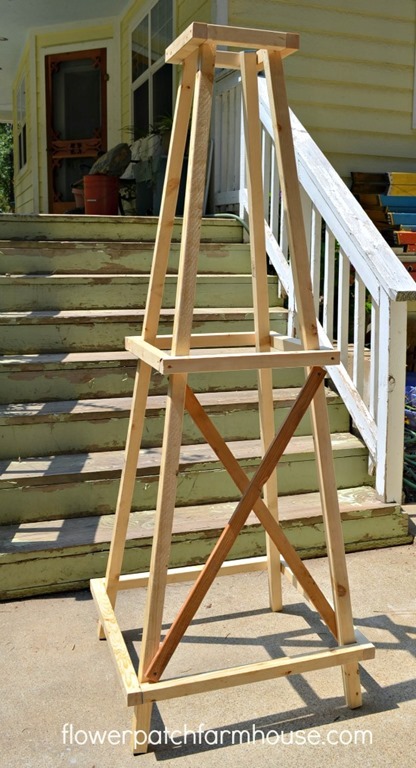 I’ve made obelisks like this before – my tip would be to paint all your wooden laths before you cut or assemble. Put all the laths side by side, paint, turn them, paint, turn etc. You’ll be done in a minute and it’s a lot easier than after assembly! You just need to touch up cut ends and even the hidden areas are protected. 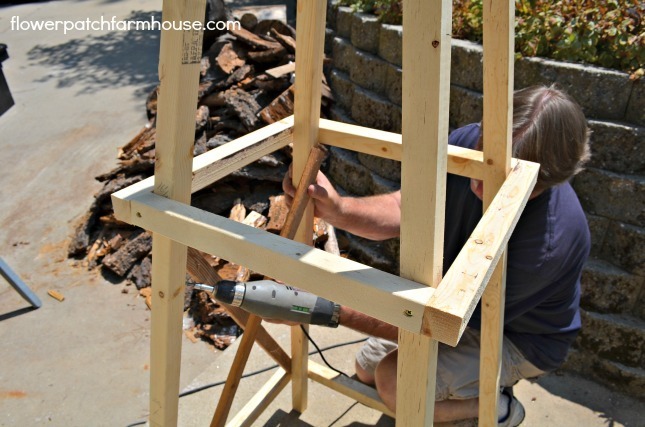 that is a great idea and one I meant to utilize when I built my arbor. My hubby took over and went ahead and made it, without me getting the chance to paint it. But he did such a beautiful job I cannot complain now, but when I build my next one I intend to pre-paint for sure! Mine are of copper metal…..love the way copper turns that beautiful green. Best of all, never need to paint it. We chose the design of the Eiffel Tower. marks the path ways of the different garden areas i want to introduce. I love the metal ones too and their longevity but they are not always inexpensive. I needed to go the cost savings route here and they give me quite a bit of bang for my buck. My husband is supposed to help me make an arbor for an entryway from one garden to another with rebar, but it will be covered with roses as soon as I can get them planted when it is complete. in my case covering a beautiful item as you are suggesting for yourself, just would ruin the artistic value. I use these to introduce secret garden area(s) using plants and my J. maples. Yes, i do have bonsais that are formed. Some of these trees are 8 to 15′ tall. Over the years lots of time was incorporated for these beauties. Anyway wish lots of luck in your endeavors. How tall would you make the one tomato plants. Love this idea. The first obelisk I made I use now for my tomatoes and it is 6 feet tall. My husband and I built an obelisk today and it turned out awesome! I’m wondering, can I put two pear tomato plants in this one, or are the obelisks for just one plant each? Thanks!